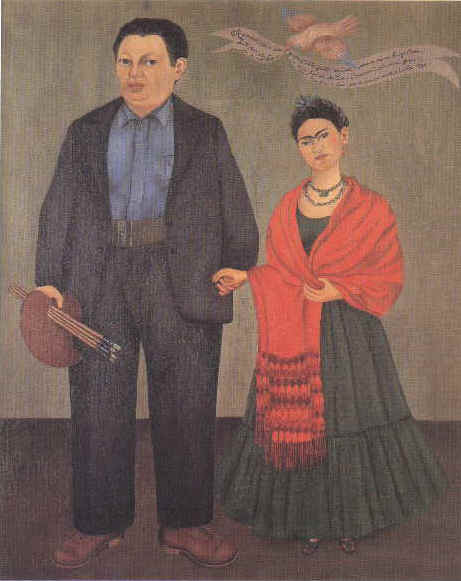 In analyzing Frida and Diego (1931, San Francisco, Museum of Modern Art), the author complains that Herrera uses gender stereotypes–Rivera “the great maestro” and Kahlo “the genius’ adoring wife”–which are not necessarily hers, but almost certainly, Frida’s. For Lindauer, Frida included the caption in the painting to assert her profession as painter, when Kettermann read Frida’s insecurities as artist into it. Lindauer also sees the caption as an affirmation that the work was commissioned since it indicates that it was painted for a friend. However, these arguments are weakened when we consider that Frida’s inscription responds to a popular dedication formula used in the Mexican ex-voto folk tradition–small metal votive offerings where, through an inscription, individuals express gratitude to God or a saint for a favor received. Lindauer’s idealization and aggrandizement of Frida’s nonconformist facet and disregard for other more old-fashioned components, regrettably follows the outdated “masculine paradigm of great artists” that she means to deconstruct in the first place. Lindauer’s analysis of the theme of motherhood in frida kahlo paintings, insensibly reduced to its relationship with post-revolutionary nationalist ideals, is an example of her frequent sterile, speculative exercises which many times obliterate the most basic human feelings, the most essential components of Frida’s autobiographical oeuvre. Commenting upon Robin Richmond’s opinion that Frida might have had a baby had she followed her doctor’s order to rest, Lindauer writes that “symbolically Rivera is cast as if he accepted his individual responsibility to build a stable post-revolutionary society through the propagation of children … [and that] Kahlo accordingly is cast as a traitor who recklessly put her individual whims before her social responsibility”. The cultural weight of not being able to bear a child in Mexico certainly cannot be reduced to post-revolutionary social responsibility since it has much deeper and painful psychological associations related to the definition and fulfillment of gender identity within society. In Chapter II, Lindauer criticizes authors who blame Frida for her own bad health. According to them, some of Frida’s pain and suffering could have been alleviated had she followed social and medical prescriptions which, for Lindauer represents the patriarchal order. Consequently, she reads Frida’s paintings, not just as a testimony of a tortuous medical history but as symbol of resistance against the socio-medical oppression exerted on women. The perspective of study that Lindauer assumes in this chapter is original, but some of her arguments are flawed. For example, in her analysis of The Broken Column (1944, Mexico City, Collection Dolores Olmedo Foundation), Lindauer sees Frida’s broken spine as a “phallus, in the Lacanian sense, equaling patriarchal order” . Yet, the broken column that miraculously supports Frida’s open and pierced body is Ionic, the classical Greek order used in the construction of temples devoted exclusively to feminine deities, which makes the phallic reading unwieldy. In Chapter III, Lindauer argues that Frida is a surrealist, not in the Bretonian patriarchal sense, but in the Lauretianan understanding of the femaleness of being a feminine subject. However, it is clear for anyone familiar with Frida’s work that, even though she did not share the frequent surrealist’s objectification or sexual categorization of the female body, most of her paintings are clearly surrealist since she shared the surrealist’s intuitive and theoretical interest in exploring the unconscious. Chapter IV challenges Frida’s assumed nationalism in favor of more complex and less utopian feelings of national identity. To this end, Lindauer focuses on a series of self-portraits by Frida where she represents herself in folkloric Mexican gowns. She discusses extensively the philosophical and political trend known as arielism but, curiously enough, she leaves out Frida’s role within the Mexican Communist Party, and the passionate divisions that the arrival and later assassination of Trotsky caused within the Mexican movement.